What if This is the Max for Kepler? 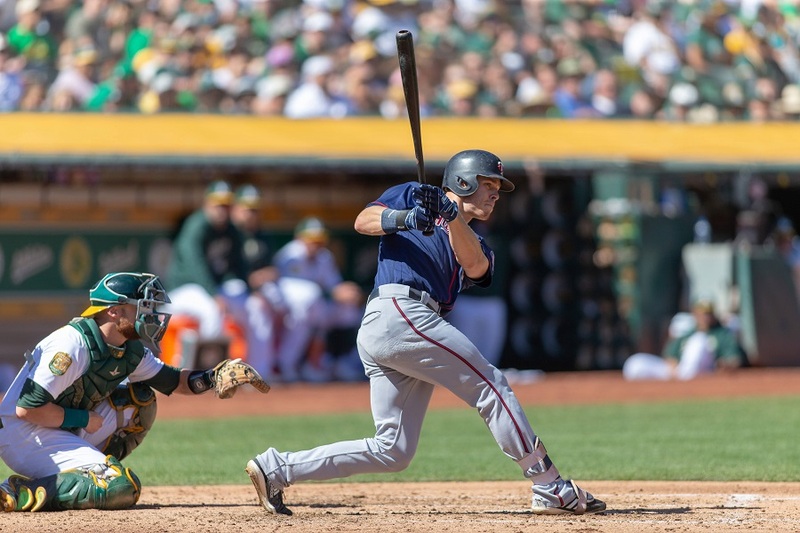 At the end of the 2018 Major League Baseball season the Minnesota Twins had a trio of main narratives. First and foremost, this was a team that took steps backwards after a Wild Card appearance the season before. Secondly and thirdly were the double-headed monster representing lost seasons for cornerstones Byron Buxton and Miguel Sano. Lost in all of this though, was the year another member of the current core endured. Max Kepler played 156 games and there remain plenty more questions than answers. Entering the 2019 season, Kepler will be a 26-year-old with over 400 games and 1,600 plate appearances under his belt. He’ll have what amounts to roughly three full big-league seasons and should be more prime than a prospect at this point. Looking back at the past two seasons however, growth is hard to find, and time may be running out. In 2017 Kepler posted a .737 OPS that was buoyed by an .828 OPS against righties. Despite never seeing significant platoon splits in the minors, he was routinely getting benched against southpaws down the stretch. With a .453 OPS against lefties, Paul Molitor had determined he was untrustworthy with a bat in those spots. Fast forward to 2018 and we’ve got normalization, but little else. Last season Kepler owned a .720 OPS vs RHP and a .745 mark against LHP, though the power came almost exclusively against righties. Right now, it’s hard not to wonder where the past two seasons leave things with Kepler. He got out of the gate quickly in 2018, posting a .921 OPS through April 30. Owning just a .690 OPS the rest of the way however, he went from a plus-bat to a mediocre one. In a season that the Twins needed someone to step up during the absence of Buxton, it was Jake Cave who proved more notable than the expected-to-improve German. Posting a career best 2.6 fWAR it wasn’t all downhill for Max a season ago. What bolstered that mark was his emergence in the field. Kepler has been a capable defender during his career, but the 6.6 defensive value was light years ahead of where he’s been throughout his professional tenure. He posted 10 DRS across all outfield positions, which nearly doubled his previous career high. With the expanded role Kepler also fared well on the Statcast leaderboards. His 10 outs above average was tied for 11th in baseball, and he contributed 3% to his expected catch percentage this past season. That’s up slightly from the 8 OAA tally from 2017 and helped to fill the void felt by Minnesota being without the OAA leader in Byron Buxton. All things considered the Twins need to feel a more significant all-around impact from Kepler going forward. It’s great that his defensive game has continued to raise the bar, but offensive stagnation at this stage of the game is anything but ideal. His 37.1% hard hit rate and 15.9% ground ball rate were both career bests, but there’s room for improvement in the middle. Kepler has been vocal previously about his lack of desire to elevate the baseball. We’ve all but concluded that the most successful way to launch the baseball is increasing the launch angle. Despite his reservations Kepler’s results trended towards that reality this season. Unfortunately, his 46.2% fly ball rate and 37.8% line drive rate weren’t more married together. Rather than achieving an optimal launch angle, Kepler lifted often with little room for error. His 9.9% HR/FB was a career low and has trended downward each of the past two season. Whether it falls on James Rowson in 2019, or a different coach entirely, continuing to get Kepler’s buy in to the launch angle revolution is a must. The more he understands the approach, the more likely he becomes able to execute upon it. Right now, it’s all but set in stone that Max Kepler will open 2019 as a starting outfielder for the Minnesota Twins. The new manager will be tasked with getting the best out of Byron Buxton, and Eddie Rosario is inked in as well. Max continuing to tread water could lead to ceded playing time to Cave or some yet to be realized commodity. As important as it’s always been for the Twins to develop Jose Berrios, Sano, Buxton, and Rosario, it’s equally important for Max to step up with that group as well. The breakout needs to come, and soon would be great. I agree with much of this article and I also believe that Kepler is extremely fixable. He’s shown an ability to make adjustments. His improvement vs LHP is a testament to that. He has already demonstrated an advanced command of the strike zone as indicated by strong BB and K rates. That skill in and of itself earns Kepler at bats in 2019 IMO. With the likely retirement of Mauer and the possible departure of Grossman, there are few players the Twins will have that have demonstrated strike zone command. Reducing his playing time would be foolish and lead to a team full of swing and miss hitters. I don't think it's any coincidence his value defensively skyrocketed because of Buxton's absence in CF. Expect to see a decline next season: especially so if he spends a good portion of his time at 1B. His offensive numbers as a whole hasn't changed, even when he's seen success against LH pitching. It's possible he puts it all together and hits RH like 2017 and LH like 2018... I'm not confidently predicting that though. That being said, I would seek a trade off of his career high fWAR season and 3 years of control left. The bat is average, plays above average RF and CF in a pinch. There's value in that and he should generate interest. Who knows, maybe him packaged with prospects could help the Twins acquire a difference maker. He has already demonstrated an advanced command of the strike zone as indicated by strong BB and K rates. Wouldn't "advanced command of the strike zone" mean getting on base with regularity? He was one of the worst on the team for OBP -- and this year was his personal best. I'm not saying Kepler is a lost cause but I don't understand this line of reasoning. K and W rates mean nothing if they don't get you on base. When looking at Kepler's spray charts, he can literally hit the ball anywhere. He is unique in this regard. The problem is on his fly balls, which he hits a lot of, the hang time is too high. He is basically an outfielder's dream, and this isn't a new problem. How do you coach a guy to stop hitting lazy fly balls? And if pitchers can induce lazy fly balls out of him so often, isn't that as good as striking him out? Pitchers usually win their at-bats v. Kepler. Statcast suggests Kepler's hitting is exactly where it should be when considering his K+W+Quality Contact Rates. I would say trade him, but every other GM has access to this information. Good luck. Having said that, per this page Mitch Haniger is the next legit big star. Get him on the team, Twins. (And, BTW, it also suggests Jake Cave is due to break out). He was one of the worst for obp because his batting average was so low. His BB rate of 11% was better than any Twin with more than 100 PA other than Grossman, including Joe Mauer. His 15.7% K rate was team best with at least 100 PA. Austudillo only had 97 PA. That shows he’s not swinging at pitches he shouldn’t be very often. I think the initial post is spot on. His launch angle needs improving. Too many pop flies. He needs more line drives. Then he's an above average player. If they had nine guys otr up that much war, they'd be thrilled. That's true. I don't know how he's going to remain a 2.8 fWAR player if Buxton plays 120+ games in CF. Or if he slides to 1B. That's going to require him putting it all together at the plate. Have him learn Shortstop or Catcher - his numbers would be acceptable there. I personally think that Max will turn things around at the plate next year. Being left handed might hurt him some in those positions. I ABSOLUTELY do not think anything involved with 1st is a good idea. He is a very good fielding outfielder whose bat is starting to be a bit suspect, maybe. Put him at 1st and his bat becomes very suspect instantly and his defense is not nearly as valued. I have thought a ton of Max since the first 20 games I have seen him. I have touted him as a left handed version of Ellis Burks(50+ war career) So far he has not lived up to what I thought I saw but he needs to stay in the outfield. If he gets beat out and becomes a 4th OF, well that isn't the worst problem in the world. He's a cog, not a difference maker. Solid player but expendable, especially with Kiriloff coming up. I'd consider trading him and let Cave/Wade hold the corner down until Kiriloff but if they don't get a great offer, we could do worse than letting him play for us. It's too soon to give up on him. After his start in 2018, there was an article talking about how the best of Kepler is still yet to come. The approach and peripherals all seem to be there, and he can be pretty good in something that's a bit more than a hot week. I think we are souring on him a bit too fast. In my opinion, he deserves patience for 2019 and probably 2020. His platoon splits are also odd. It would be one thing if one side consistently beats him down, but that's not the case. He's still learning. Side note, but if Buxton's absense suddely improved Kepler's value, then I stand by my assumption that defensive metrics remain trash. Kepler suddenly doesn't become a better OF simply b/c Buxton is in AAA/DL. His stats for hitting doesn't look good but watch him day in day out he's going to hit in his career at some pretty good numbers. He takes good at bats and swing is what you want out of hitter. I think he was bit unlucky this past year where he has hit baseball hard but seemingly right at some one. Everyone is concerned about his age but he is relatively young were doing same thing here we did with Aron Hicks some players take little longer to develop into the player everyone wants. I think he has worn down each of the last two years effecting his numbers especially toward the end of season. This is also result of Buxton problems where both he and Rosario have had to play more and move positions for the Twins replacement outfielders. If we trade him i am betting people here will be writing why we ever let him go here in couple of years. He has all the tools to become star player and what I see and read about him his attitude is good and he's adapting to become a better player. Another thing is everyone has fallen in love with Cave but remember this is small sample size and there were reasons New York let him go. His numbers have not been impressive until he came to the Twins and like i say the sample size is still small. We have to see how this plays out in full season of baseball our impressions may change before next season is over. The time to trade Kepler was 2 years ago. Now, the value is in keeping or even extending him. He reminds me somewhat of Christian Yelich. But also of David McCarty. Maybe someone will overpay for him, but I doubt it. Better now to play it out and hope his talent comes through. I've always thought he was a little overrated. Started baseball late but started his career early. Wasn't a big time prospect until he developed power which came at the expense of contact and left side splits. Stays closed down on the ball. Needs to open his chest and pull the ball. All of his hard hit balls are pulled anyway. Embrace it. The Twins have many more serious problems than Kepler. Your basically getting Oswaldo Arcia's bat with better defense. Extremely disappointed that Kepler hasn't taken a step forward.A .224 BA is pitiful. I envision Kepler improving as he moves forward.He is nearing the age of peak performances and I hope he shows a learning curve to go along with it.If he is a difference maker in a trade that really improves us, I would be fine, but for now Rosario/Cave/Kepler are our outfielders until Buxton proves he can be a MLB batter as well as fielder.Grossman is still currently number 4 and I wonder how much the FO likes Wade since they gave him no time in September. The purpose of the metrics is to tell us now much he contributed to team defense, not to tell us how good of an outfielder he is. That doesn't make the metrics trash, it just demonstrates what the metrics do and what they don't do. Your value can and should go up and down because of the position(s) you play even though your quality of play doesn't change. Value and quality of play are not the same thing. Started baseball late but started his career early. Did he start late? That had always been my assumption, but I ran across an article about him that said he played a ton of baseball in Germany as a youth, starting at age 6. His mother is an American, so apparently he embraced that side of his heritage. Obviously the level of competition in Germany wouldn't be high, but it's not like someone handed him a baseball bat at age 17 and said, "here, give this a try - no, hold it at the knob end". 20 home runs, 30 doubles, great K and BB rates, and the Twins just gave him the award as the best defensive player on the team...in center and right field. Lets remember where he came from and the caliber of play he had before moving to Fort Myers when he was 17 years old. Am I somewhat disappointed that his average wasn't better this year?Like everyone, yes.And I expect Max was more than disappointed.Last year his winter marching orders were to focus on hitting lefties...done that.Lets sit back and see what he does next year after this winter's work.I for one still see him as a fixture in the middle of future Twins lineups. That shows he’s not swinging at pitches he shouldn’t be very often. He is swinging at bad pitches. Pitchers are inducing pop flies off of him with regularity. He was very good in the minors and was probably kept down there too long, contributing to his one-dimensional hitting. The level of competition in Germany is pretty good. It's mostly American families who live over there playing baseball, and there are some well-known coaches from the US running the teams. They're not "little league world series" caliber teams, but they're better coached than 80% of the neighborhood teams in the US, and I'm being very generous on the US side with that figure. A Twins Mainstay Dying Before Our Eyes? → Article: What if This is the Max for Kepler?